Carboxylic acids can be prepared by treating a Grignard reagent with carbon dioxide (usually in the solid form known as “dry ice”). The product of this carbonation process is a carboxylate salt, which upon protonation by aqueous acid yields the carboxylic acid. 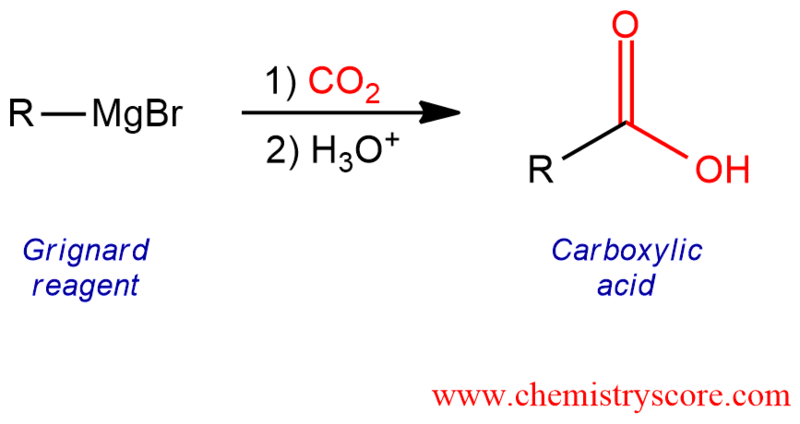 In the first step, the Grignard reagent attacks the electrophile center of carbon dioxide, generating a carboxylic ion. These two steps occur separately because otherwise, the first step would take place before the other.